Experts have been called in to examine the Google ghoul filmed at a former Victorian docklands which has a dark and sinister past. 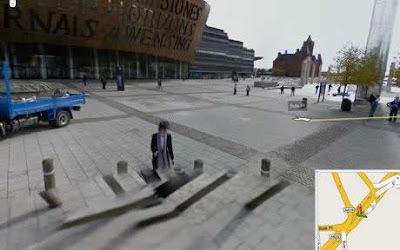 She was captured by the Google Street View cameras in Tiger Bay, Cardiff - the scene of murders and unsolved mysteries going back 200 years. Local medium Jane Cohen, 39, said: "Apparitions have often been caught on film but are invisible to the naked eye. But what is really strange is that she doesn't appear as a full figure - you can't see all of her." Now, either the editorial staff of the Telegraph thinks its entire readership is completely thick between the ears (and I'm sure a good percentage of them are) or, the entire editorial staff of the Telegraph is thick between the ears. The only clue that they are not would be the quotes around the word 'ghost' in the headline. The 'local medium' is thick between the ears by definition so I will let her off. She has no choice but to grasp at any straw thrust her way. The journalist only needed to consult ANY of the telegraph's photographic staff to reveal this as the non-story it is. Google Street View images are stitched together from many separate photographs from moving cameras. As the point of view is changing a little or a lot between each recording it follows that the joins will often show. The join in this particular image is so bleeding obvious that I am amazed that the Telegraph had the gall to try and pull this off at all. Look at the posts around the 'ghost' and look at the distorted posts below the stitch line to get an idea of how different the camera placement is. Indeed it seems to me that the part of the image below the 'ghost' is made up of at least 3 images. All in all this is the most pathetic attempt at passing nothing off as a spirit photograph that I have seen in years. "IS there no end to this gobshite!?!?" - Father Jack. Even I, a mere starting hobby photographer looked at that one and said, Oh, it's stitched together. Moreover, the person looks like someone dressed as Tom Bakers Dr Who, on their way to a nerd off.